Hello All, I am going to interrupt my series on the Volga area costumes at the request of my niece, Anna. She is an artist, as most of the members of our family are. She has a cutout that my grandfather was going to paint, but never had the chance to finish. It is a girl in Ukrainian Plakhta costume dancing. So i am going to detail this costume. 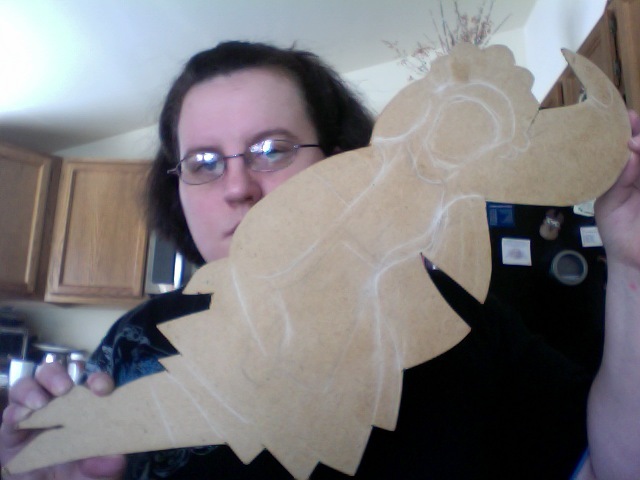 For those of you who are interested, here is Anna with the cutout, which has only the simplest of sketching in. She might let me show you the finished product. 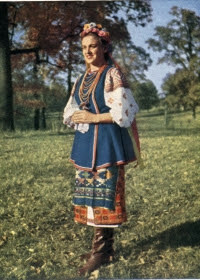 This is one of the five major types of Ukrainian costume. It is sometimes called the Poltava costume, but in fact, it is much more widespread. 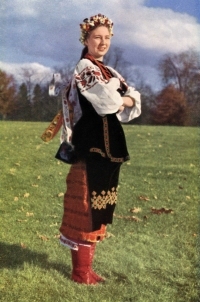 The Poltava is just one version of this costume. I will describe a generalized version of this form of dress. 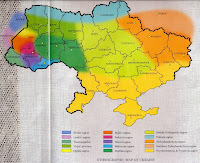 This is what one generally sees presented as the national costume of Ukraine. 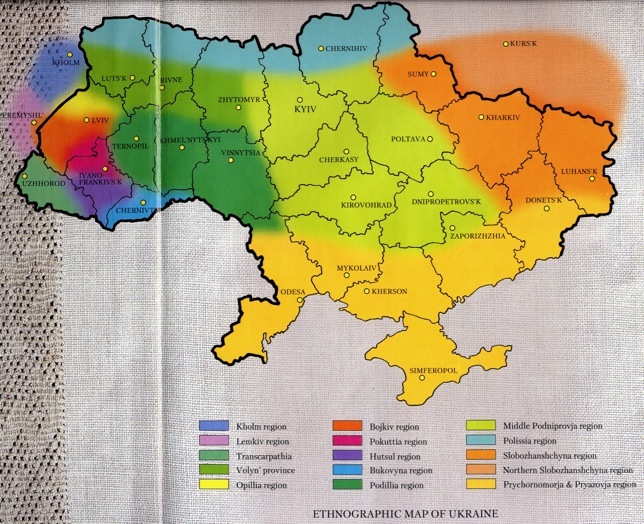 On this map, this is the costume of the light green, orange and dark yellow areas of this map, the central, eastern and southern regions of Ukraine. 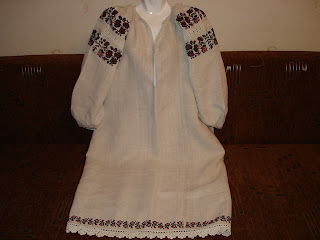 Like Most costumes of eastern Europe, the base of the costume is the chemise, in Ukrainian called Sorochka. The basic cut is this one. 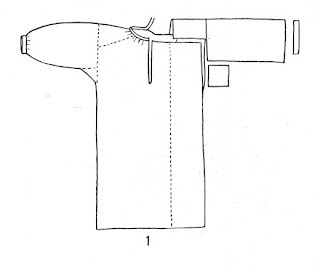 and sometimes there are designs scattered over the lower sleeve, or forming a vertical line down the body of the sleeve. But the one band across the inset is always embroidered, even for everyday wear, there is at least a narrow band. 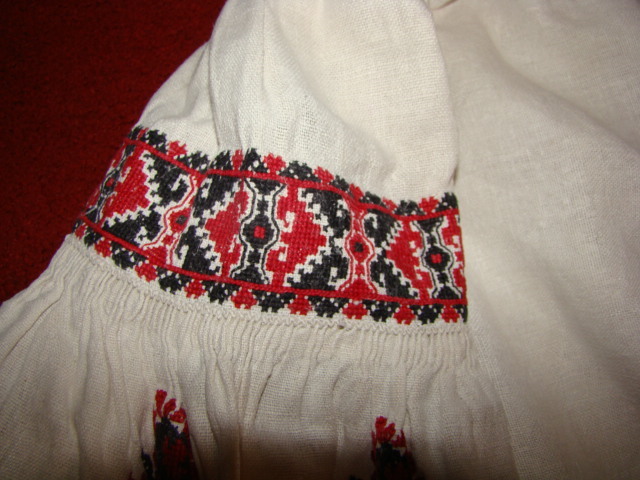 The sorochka is also embroidered along the bottom hem, and sometimes along the neck and wrist bands. This costume is named after the type of overskirt worn, the Plakhta.This is made of two pieces of cloth woven in an intricate design composed of squares, with a design woven in each of the squares. It might be described as a checkerboard, but NOT a plaid. i will do a posting showing some of the designs later. 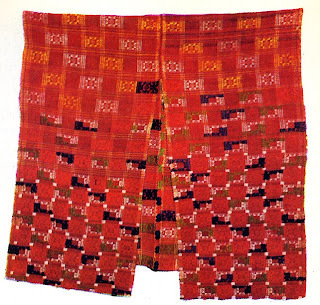 The pieces of cloth are narrow because of the limitations of hand looms. These two pieces are sewn together with an ornamental stitch somewhat more than halfway in what will be a vertical seam. This is shown in the drawing on the left. The edges are bound, and the 6 corners are often decorated with pompoms. The top half is folded over a sash, and hangs over the bottom half. 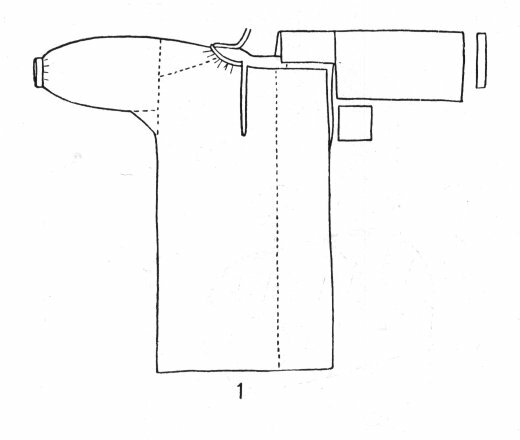 The sash is then tied around the waist, and tied so that the plakhta is secure, and centered on the back. Typically it does not meet in front. Here is a photo of a plakha folded and ready to put on. This is what will become the back side. 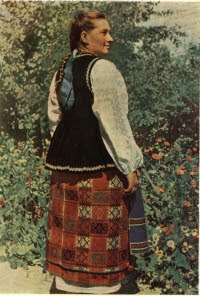 Here is a photo of a woman wearing the Plakhta. She is wearing a chemise with white on white embroidery. The apron is a simple rectangle, made of one width of material, either of linen with a horizontal embroidered band towards the bottom edge, or of a colored material, with woven designs, ribbon sewn in horizontal bands, or embroidery, again towards the bottom edge. A second sash is tied around the waist over the apron. The outfit is often worn like this, but over this may be worn the Kersetka. 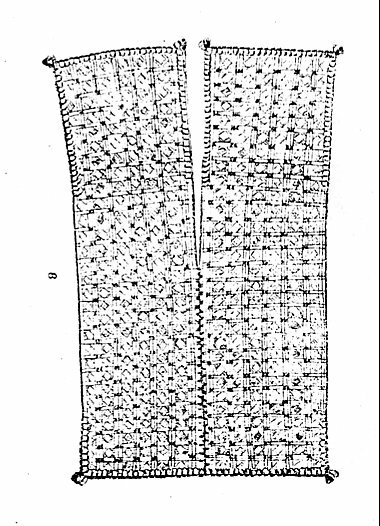 This is a type of vest which hangs to the hips or below, hangs smoothly in front, and has pleats in the back for fullness below the waist. 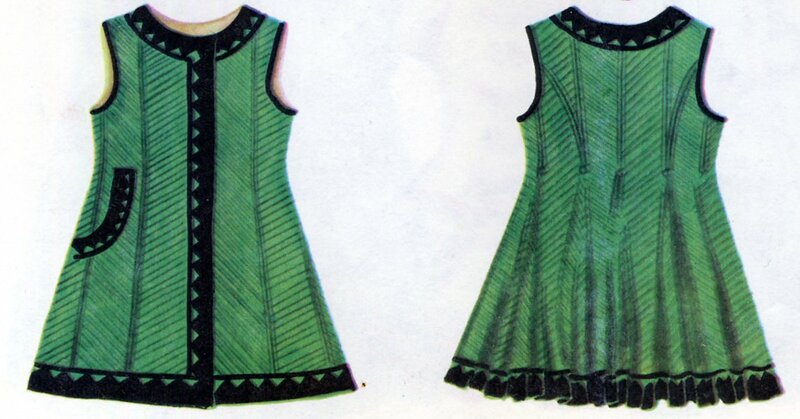 It can be made of any material, but not linen, is closed in front up to the neck, and is usually decorated with trim or applique along the bottom edge and the front edge, which overlaps right over left. This is a more recent garment, apparently based on the cut brought in by the Tatars. This is finished off with red coral beads, amber or other type of necklaces, and for unmarried girls, a crown with flowers and long many colored ribbons hanging down in back. This is the costume shown in the cutout. Here are a couple of examples of this costume. You will notice that the hemlines of these photos are much longer than that in the cutout. 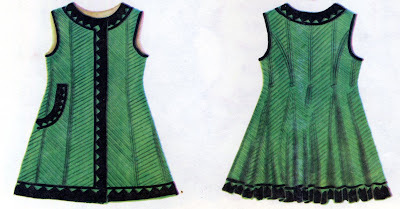 Starting in the 1950's there was a tendency to shorten the entire ensemble, the sorochka, the plakhta and the apron, to a position just below the knees. This was perhaps to make the outfit easier to dance in, but more likely was motivated by the fashion of the day, and the idea that bare female legs would be appreciated by the audience. This sometimes reached rediculous proportions. Here are some examples of the shortened version of the costume. Some performing groups are bringing back the longer hemline, especially for choirs. ﻿Thank you again for reading. I am open to researching and/or making costumes or costume pieces for interested individuals or groups, or to provide information so that others can sew or embroider folk art item. This is something i enjoy and would like to make into a career, as unlikely as that may be. I am also available to teach folk dances. As always, be creative, make something by hand, make an heirloom, make something that you can show off on your self or in your home.